Circa 1960. 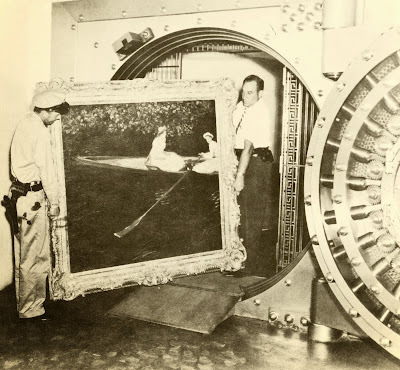 Two employees carry Claude Monet’s “Boating on the River Epte” through the vault door to the entrance of the Iron Mountain storage facility. "The Many Lives of Iron Mountain"
On most weekdays, a fleet of trucks and couriers collects materials from offices and delivers them to Iron Mountain’s facilities—there are more than a thousand of them worldwide—where they are stored, in some instances, for decades. Factor in non-paper records, such as audio tapes and data cartridges, and it’s a huge business. Last year, Iron Mountain had a little more than three billion dollars in revenue. Considered all together, its facilities may house one of the largest repositories of records in the world. The Mountain was Iron Mountain’s first facility; it opened in 1951. Today, the vast majority of the firm’s storage is above-ground, in warehouses, hangars, and nondescript office buildings, but documents still make their way almost daily to Germantown, New York, a quiet village a few miles from the Hudson River. The trucks follow an untrafficked country road lined with apple orchards, eventually reaching the mine, which is set far back from the road, behind a tall, white façade that gives it the look of an old dockside warehouse. This summer, when I visited, two men met me at the entrance: Bill Mesick, a solidly built man with a matter-of-fact demeanor, and Randy Crego, who is tall and voluble. Both of them had worked beneath the Mountain for decades before taking management positions above ground. (Mesick oversees two underground facilities; Crego is the general manager of Iron Mountain’s New York territory.) They led me through the façade’s front door and into a surprisingly normal-looking office, with cubicles, a conference room, and a fancy coffee machine. The mine, Crego said, was “like an ant farm,” with two hundred and twenty-five individually locked vaults, each with its own combination, on seven underground levels. Today, the former mine functions as a premium facility for Iron Mountain’s most demanding clients—usually clients who want to store “vital” records or objects, things that are irreplaceable or secret. Documents arrive through the facility’s neatly-organized loading dock. Chet Smith, a soft-spoken Iron Mountain veteran, sat at a workstation, affixing bar codes to a stack of cardboard boxes, inspecting a padded case full of laboratory slides, and managing a database of the Mountain’s contents. Most of the time, Smith explained, he has only the vaguest idea of what the boxes contain. (“This one,” he said, pointing to the slides, “is tissue samples—that’s all I know.”) But he knows the mine itself by heart. After working there for thirty-five years, Smith has memorized “about eighty per cent” of the vault’s combinations. “Our customers,” Crego told me later, “would die for an employee like Chet Smith: look at that longevity, that loyalty.” Along with security clearances and background checks, long-term employees are one way that Iron Mountain insures security. Today, the Mountain is filled, in large part, with colorless corporate documents. But it wasn’t always so. As we walked farther inside, toward the vaults, Mesick told me about the nineteen-seventies and eighties, when the firm safeguarded interesting objects with intrinsic value. The Mountain has stored musical instruments, valuable antiques, and celebrity memorabilia. One client, “Madame X,” was an anonymous art collector. Once a year, she’d visit with a curator, lay out a spread of wine and cheese, and admire her paintings underground. Later, Mesick and Crego pointed out an old photograph: it shows two men carrying Monet’s “Boating on the River Epte” through the mine’s interior entrance, a bank-vault door weighing twenty-eight tons. That door is still installed—a single person can move it, but just barely—and as we passed through it the air grew noticeably cooler, and a vast, roaring sound drowned out our footsteps. This was the sound, Crego explained, of the industrial-strength dehumidifiers that dry out the damp interior of the mine. Inside, the facility is immaculate. The corridors, which trace long, angled shapes and sometimes slope up or down, are freshly painted. The vaults, which line the corridors, are numbered and color-coded. You can sense the original outlines of the iron mine in today’s odd, sprawling floor plan. Mesick and Crego opened up a few of the vaults. One, which belonged to a county government, held endless drawers of birth and death certificates. Another was empty except for two large, slightly sinister freezers: one contained D.N.A. samples, while the other, empty, served as a backup for the first. At the end of a long hallway, a lonesome room contained a small data center; another room nearby held records from East River Savings Bank, Iron Mountain’s first customer. Some of those records had been deposited during the Truman Administration; E.R.S.B. now belongs to a much larger bank. Before that, Mesick and Crego told me, in the nineteenth century, iron from the mine had been used to make horseshoes. During the Civil War, it was made into canons and cannonballs. Out in the cave, there were signs of the mine’s original life. Rust-colored chunks of ore, dark and irregular, jutted from the walls. The regulatory trend seems likely to continue. Sue Trombley, director of consulting at Iron Mountain, described to me the complex “life cycle” that many Iron Mountain records must go through. As a document manager, she said, your goal is to keep documents for as long as you have to, and then to destroy them as soon as you can, both to save on storage costs and to limit the scope of any future legal proceedings. “But it’s not as simple as, ‘You create a record today, and in sixty years you get rid of it,’” she said. “Retention rules are tricky.” Some documents must be kept for a certain number of years after an ongoing business relationship comes to an end. Some current customers plan to keep their records stored for three quarters of a century. Other clients—government agencies that store birth certificates, for example—have no plans to remove their documents. The technological future, meanwhile, is more uncertain. In the nineteen-thirties, Buckminster Fuller used the term “ephemeralization” to describe one major effect of technology: over time, he thought, productivity would come to depend less on the construction of new physical objects, like factories and equipment, and more on new information, which doesn’t have a permanent, physical footprint. Iron Mountain embodies the opposite of ephemerality. It seems to be everything “the cloud” isn’t. (When I asked Dan O’Neill, the company’s director of corporate communications, to tell me about Iron Mountain’s biggest room, he described a converted airplane hangar in northern New Jersey: “Imagine the length, the height of an airplane hangar that’s floor to ceiling documents. You can’t see to the other end of it.”) The threat posed to Iron Mountain’s business by digital storage is two-fold: it’s not just that digitized documents are physically smaller, but that they can exist in several places at once. In 1997, fires swept through three Iron Mountain facilities in New Jersey; in 2005, they struck warehouses in Ottawa and London. Iron Mountain invested in better fire-protection systems in some of its facilities, but there is always an irreducible risk inherent in the storage of any unique physical object. Digital storage, one imagines, might let companies transcend that risk; in theory, it could reshape Iron Mountain’s business. And yet even digital storage is still, ultimately, physical. Although it’s a smaller player in the data-center business than firms like SunGard and Digital Realty, Iron Mountain is trying to build up its offerings. And separately, it has, over decades, developed a different area of expertise: the storage of data that doesn’t belong in a data center. After we’d explored the Mountain, Crego and Mesick took me to another underground facility, an old limestone mine located thirty miles south of Germantown, in Rosendale, New York. In a caravan, we drove into a huge man-made cave. The ceilings were high enough to collect their own lacy fog. Four underground buildings were filled with master recordings from Sony Music Entertainment, much of it in the form of two-inch audiotapes. One building held the video archive of World Wrestling Entertainment; nearby, another collection, which focussed on one of New York’s baseball teams, contained around fifty thousand tapes (not just Major League games but farm-team games, too). Eventually, Crego led me to a collection of shelves specially designed for magnetic data cartridges. It held three hundred thousand cartridges; each one, Crego said, represented a tractor trailer’s worth of paper. In the future, some new storage technology may allow the same vault to hold a thousand times as much data. But who’s to say that its occupant—a Connecticut insurance firm—won’t want to fill that up, too? Among other things, Iron Mountain’s history testifies to a psychological fact: emptiness is irresistible. When people discover empty spaces, they find a way to use them.